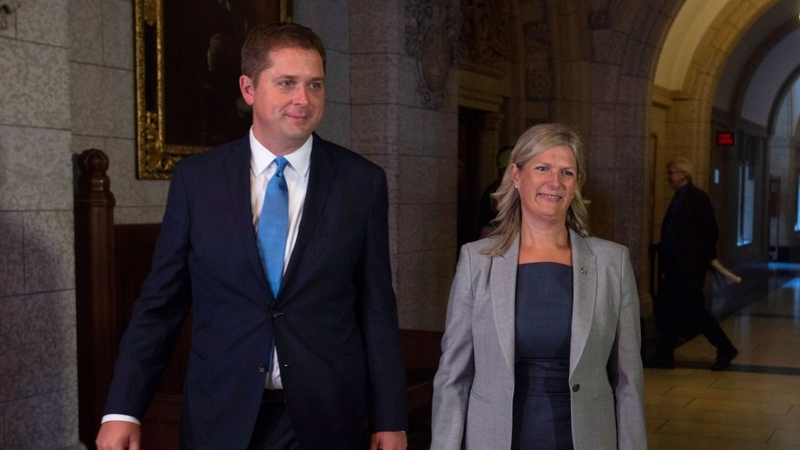 OTTAWA – Ontario MP Leona Alleslev surprised many in announcing in the House of Commons on Monday that she was crossing the floor from the Liberal caucus to join the Conservatives, in the first floor crossing of this Parliament. "After three years of hope and hard work I find myself asking: 'Am I doing everything I can to serve the citizens of Aurora-Oak Ridges-Richmond Hill, and my country?'" she said in announcing her move in the House of Commons. When asked, she was not specific about who she claimed to have raised her concerns with, and said that it’s been something she’s been considering for a while. "After careful and deliberate consideration I must withdraw from the government benches to take my seat among the ranks of my Conservative colleagues," Alleslev said. "To my Liberal colleagues, thank you. But my oath is to country, not party and my sacred obligation is to serve my constituents." Though former Liberal caucus colleague MP Robert Falcon Ouellette, who has been an outspoken critic of his own party in the past, took issue with her reasoning. "For another MP to suggest it’s dishonourable to criticize the government whether in private or in public is something that is completely wrong. My role as a Parliamentarian is simply to defend the rights of my citizens… if you're afraid to speak up as an MP whether it’s in the government side or in the Opposition side then you shouldn’t be here," he told reporters in the House of Commons foyer. Alleslev joined Conservative Leader Andrew Scheer in the House of Commons foyer ahead of question period where Scheer boasted about their new addition, saying he was "extremely proud" to welcome her into the Conservative caucus. Alleslev didn’t delay in criticizing her former leader, getting added to the Conservative question period roster on her first day to question the government’s approach to defence procurement. She asked if Trudeau would cancel the "flawed" purchase of used CF-18s from Australia. The former Canadian Air Force officer was a rookie MP elected in 2015. As a member of the governing caucus she held the role of parliamentary secretary for public services and procurement—which includes being a spokesperson on the fighter jet file— between December 2015 and January 2017 before being shuffled out of the parliamentary secretary ranks. Alleslev has been given a critic role in her new caucus: shadow cabinet secretary for global security. "Ms. Alleslev is an extraordinary and accomplished member of this House," Scheer said. “She will be encouraged to bring her perspective, experience and expertise to table to hold this government to account." Scheer also took the opportunity to make a direct pitch to voters: "If like Leona, you supported Justin Trudeau and the Liberals in the last election and you are frustrated or even angry with ineffective leadership, know this, you are both welcome and needed in the Conservative Party of Canada." On CTV's Power Play, Scheer said he’s hearing every day from Liberals who say they voted, or volunteered for the Liberal Party and have had a change of heart. On his way in to the House of Commons moments after Alleslev’s announcement, Trudeau seemed to already be getting ready for his remarks in the House, stating: "Mr. Speaker, this is something that we’re allowed for in our system obviously. I wish her well in her decision." As of July, when Trudeau was in her riding, Alleslev tweeted that she was "proud to be part of this team" heading in to 2019. And, back in March, Trudeau joined Alleslev at an event at the Stronach Aurora Recreation Complex, which bares the family name of a former local MP who was also a floor-crosser: Belinda Stronach. While there, Trudeau thanked her and a few other Liberal MPs from the area for doing “an incredible job” representing their communities, and said he was "so thankful" to have them on the team. Alleslev won the riding in 2015 by a narrow margin, beating out then-incumbent Conservative MP Costas Menegakis. On Monday she indicated her intent to run there again in 2019, but under the Conservative banner. Following the news, Mengegakis -- who was planning to once again run again in that riding -- said that he would be withdrawing his candidacy and instead seeking the nomination in a neighbouring riding. On CTV's Power Play, Alleslev made it clear she has no intention of resigning her seat and re-running in a byelection ahead of 2019, as some believe should occur. She said she’ll leave it up to her constituents to weigh in come 2019. "Between now and the next election it’s my job to serve them to the best of my ability, and then I’ll be judged and they’ll decide," Alleslev said. Asked about the floor crossing on CTV’s Power Play, NDP Leader Jagmeet Singh said Alleslev should offer herself up in a byelection. The NDP have a policy that floor crossers must run again before joining the caucus. "When someone crosses the floor it doesn't respect the will of the people," Singh said.